Get a Glowing, Most Natural Looking Makeup Finish! Natural looking makeup is the best way to look like yourself, but better. Just a little more polished, and healthy. It’s not makeup that makes woman look unnatural. It’s too much makeup, and makeup that’s not applied properly…. The only difference pre and post makeup will be that you’ll ‘naturally’ have no blemishes and marks. 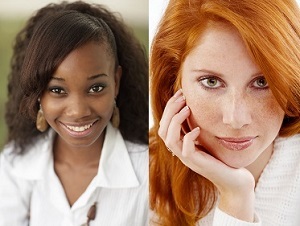 These are all natural signs of natural good health and beauty, which is not unnatural at all! The makeup you will be using depends entirely on what you need. If you have the problem, address it using the right product. Otherwise keep the products you use to a minimum. This will give you the most natural looking makeup results. For example, if you have no dark marks, under eye circles, or spots, you have no need for concealer so you just skip it. Concealer to Hide Dark Marks and Spots- These are things that will not be covered by using foundation alone. Highlighting Primer- Primer will create a thin barrier between the skin and foundation, and helps it to stay on longer. One with highlighting/ brightening properties lends a glow to the skin’s surface. Liquid Foundation- Use a liquid because it will give you the most sheer, light finish and not dry your skin out. When buying it, remember to swipe the color on your cheek. The color must disappear into your skin. Makeup Sponge- A sponge applies liquid makeup most thinly and with the dewiest finish. Brown Eyeliner- Brown is not as obvious as black, so a light or dark brown liner that corresponds to your natural skin tone will softly define your eyes. If your skin is dark chocolate and deeper, you can opt for a black liner. Eyebrow Powder- a brown powder similar to the eyeliner you will be using. Otherwise you can use the same liner to define your brows. A Firm Eyebrow Brush- An angled brow brush works best. Powder Foundation/ Translucent Powder and Large Powder Brush- If you have darker skin, rather use a powder that matches your skin color. Translucent is not really colorless and may dull down your skin tone. This is the most important aspect of getting a natural look. Your goal is even colored skin that is bright. First cover obvious dark marks and spots with concealer. This way, you end up needing less foundation. The concealer will cover the parts that detract the most from the smoothness of your skin color. Second, apply the primer all over the face using the wet sponge. A sponge lays it on thinly so that you don’t end up with heavy layers. 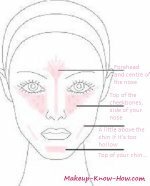 When applying, don’t rub it in or be press it in too hard so as not to move the concealer around. i.e. don’t wipe the concealer off. Let the primer dry before applying foundation. The other option is to use the highlighting primer after foundation. In this case, you'll just apply it under your eyes, and over the cheeks. Then, finally apply your liquid foundation- also with a wet sponge. Make sure there are no streaks by just blending them out with your fingers afterwards. You’re going to define your eyes softly, and if you prefer, discreetly. If your goal is to look like you’re not really wearing makeup, tight line just the top waterline. Tilt your lid a little to expose the underside of your lashes. Then run a line along it. If your goal is just minimum eyeliner for defined eyes, line the bottom waterline, and the top lash line as well. Then take the angled brush and smudge these lines out. They will be there, but in more of a shadow form that gives softness to your eyes. For your eyebrows, make sure that they’re well shaped. Assuming that you've determined your best eyebrow shape, fill them in to complement your natural looking makeup. Apply the eyebrow powder with the eyebrow brush so that the shape is nicely defined. If you make them too dark, run your wet sponge with foundation over them. This should lessen the color. If you opt to use eyeliner (and if it’s more creamy than pencil-like), place some color from the eyeliner on the brush first. Don’t line with it directly because then it might be too harsh. Just brush a little color on to fill in ‘bald’ spots and define the shape. Finish off with one or two layers of your favorite mascara. Apply blush with a brush in just a few sweeps. One or two max. So you’ll have very subtle color that is hardly noticeable, but is there. That way it looks like it’s coming from under your skin. Then dab a lipstick that is the same color as your lips on the bottom lip. Put your lips together so that it rubs off on the top lip, and also diffuses the color. Top it off with a little gloss if you like. Set your natural looking makeup face with a little powder if you want it to stay put. You don’t want it to look matte, so use a big powder brush. Then do a few, feather light sweeps on your face with the powder.